Hello Everyone...welcome to the Pretty Pink Posh and Winnie & Walter inspiration Blog Hop! 1. To begin my card I first die-cut my sorta cloud look using the new October release dies from Pretty Pink Posh Stitched Borders 2 Dies (large scallop). 2. I then distress the scallop die-cut using the Distress inks in Wild Honey and Peacock Feathers and added some ink splatters with the same colors mentions after diluting a little water on the acrylic block. 3. Next I stamped the sentiment from Winnie & Walter's A Tree For All Seasons stamp set and put the die-cut pieces aside. 4. Moving on the card base of the card, I then distress the bottom of the card (distress ink in Crushed Olive) using the curved stitched die from Pretty Pink Posh Stitched Borders I Dies. 5. Next, I stamped the dog and cat image from the past Winnie & Walter release from This Awesome House stamp set, after stamping the tree image twice and adhered on top of the other A Tree For All Seasons. 6. The tiny bird on the tree branch is also from A Tree For All Seasons stamp set. 7. Then, I adhere all of the pieces together added some more splatter on the card base. 8. For the final touches couldn't help but add more Lemon Meringue 4mm/ 6mm Sequins from Pretty Pink Posh. Your next stop is at the amazing Kelly Griglione blog. Have a WONDERFUL day Hopping!!!! Oh Joni, I adore the scenery you designed! What a fantastic card! Joni, Lovely card you have created. The small cat and dog under the tree with a birdy :D the distressing is superb! I just love this cute scene! The clouds are fantastic; love that idea! This is so pretty! I really like the colors and blending! Great use of the products! What a charming scene and I love your big billowy clouds! What a neat idea to use the stitched border die as clouds...very creative! What a beautiful, inspirational card, Joni. Love the colors and the design of your scene! What a great card I love the meaning of this! Thanks! WOW Joni, this is so beautiful. I love the addition of the animals. Adding my cheers and applause to the others: a gorgeous scene with a heart-warming message. Beautiful card in every way; Inspired and inspiring! Love this scene you created, Joni! Very pretty! I love that you added a puppy to your card so cute! I am getting so many ideas from this blog hop. Love how you used the PPP scalloped die! Thanks for the inspiration. Gorgeous!! I love the clouds!! Very nice!! This is a lovely little scene! The sentiment is perfect for it. What a sweet scene Joni. Love the darling images, the splattered background... the scallop clouds/sky is amazing. Adorable scene! I love that scalloped border used as clouds! You never fail to blow me away. Gorgeous! Love the card, So sweet. Excellent sentiment for an awesome card - so very pretty!! Thanks for sharing it! So super cute Joni, love the tree and coloring! This is so pretty!! I love love love the beautiful clouds, & how you've inked and layered them!! What a cute scene! Love the scalloped sky! Such a sweet scene ... love your layered clouds. This card is so pretty and sweet! I love it. Such a beautiful card! Love the way you used the dies! Oh , how utterly charming, the clouds are so pretty too! This is such a sweet card. I love the way you've done the tree. Oh my gosh, I love the diecut clouds of the scene! And I love that you gave them a bit of coloring! Beautiful and amazing card. A beautiful card.... fabulous colors and the perfect bit of sparkle! I really like what you've done with the tree for all seasons! The splatters are a nice unexpected touch! Those tiny animals fit so nicely together in this set! I hope that I am a winner; like you! Thank you for sharing with us hoppers/shoppers this fantastic Friday! Super cute card! I love the animals! This is such a incredibly lovely card. Gorgeous color. Beautiful, I just love the clouds.. so soft and pillowy :D great job! Love the card and sequins! My..What a stunning card. I love the layered clouds and the colors. What a beautiful scene you created. Just sweet. What a beautiful piece of artwork you've created here! It has such a dreamy, storybook feel to it....I absolutely LOVE it!!! You must be tired of hearing this, Joni, but you are a GENIUS! I'm in awe how, week after week, you manage to take (almost) the same supplies I have and create things from them that I couldn't even dream of! Granted, sometimes I dream of stuff and then fail to translate it to the real world, but your projects are simply out of this world. I always take away something inspiring from your blog posts, and today it certainly is your color combination for the sky. So. Very. Lovely. Love how you did the clouds, very clever! Beautiful card. Wow, such a beautiful card! Love it! What a sweet scene you created! I also love how you used the scallop border die to make clouds! So creative! Such a pretty card! Love the inking and that tree! Oh wow, this is so adorable!! Love the little puppy and kitty in this scene and the sequins look amazing! Beautiful card! 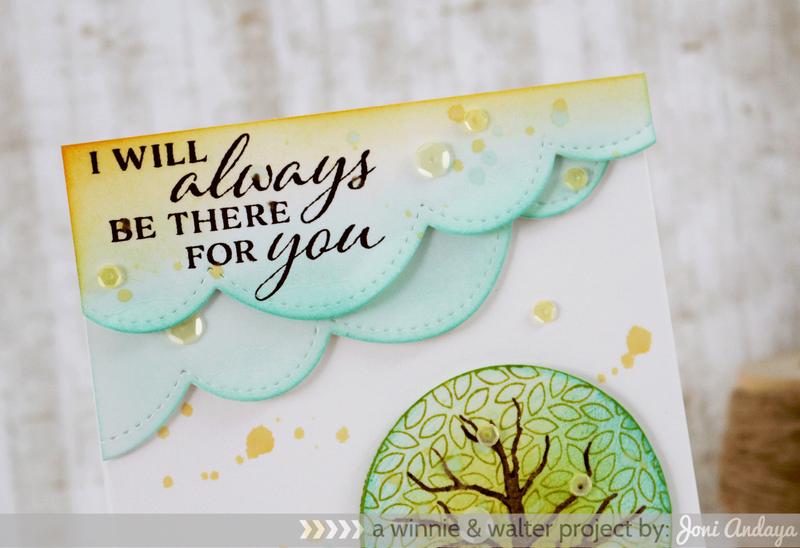 I love how you used the scallop die to create your clouds! Wow...your card is amazing...the colors and design are fantastic! I love the way you used that die to mimic clouds. It is such a pretty card and the bird in the tree is perfect! Wow! Your card is stunning, that scene is perfect. I adore this colour combination. It is a wonderful and thoughtful card. aww!! what a beautiful scene!! love the coloring on the clouds... very cute!! This a beautiful card and I love the colors you used. Such a sweet scene! Love how you used the border for the clouds and sentiment and the inking on this card is just wonderful! Love your color scheme! Very sweet card. Oh wow, how pretty! Love the little critters and the layers & inking are beautiful. Im in awe of your artwork. This card is so serene and sweet. Omg stunning! You guys are amazing. What great inspiration! OMG i love your card, is a super sweet and beautiful scene!!! This is adorable! Love how you thought outside the box on the clouds! I like how the sequins mimic the splatter on the card. Well done! Such a pretty card! Love your scalloped detail with the ink! So striking! The clouds are perfect. I love the colors and the hints of sparkle! Love scene cards. Your design is beautiful. What a fabulous card! I really like how you did your clouds. Lovely colors and I just love the clouds! I love the way you used the border die on your pretty scene card! 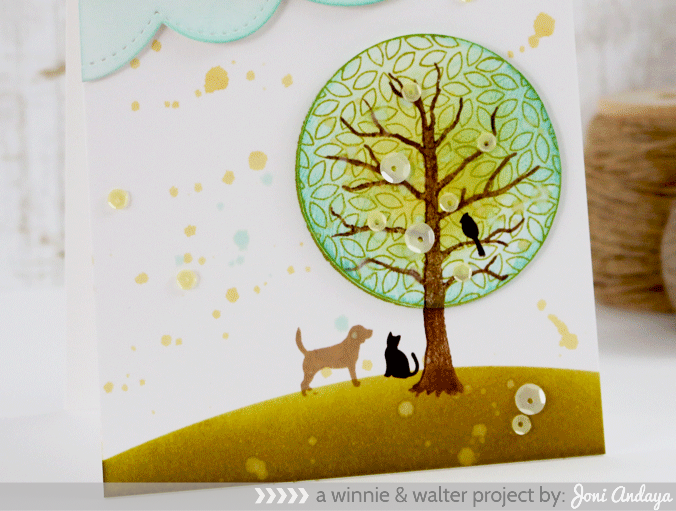 Such a lovely color scheme and sweet scene you created on this card! what a beautiful card!! love how you used the dies! I LOVE this tree! Your creation is BEAUTIFUL!! Thanks SO much for sharing! LOVE all this inspiration!! Have a GREAT day! What a cute card! I like the bird, cat and the dog! Very cute! Lovely card Joni, the colors you have blended are awesome together and the bit of sequins top it off perfectly. Love the clouds and the colours! Absolutely gorgeous card! Love how you did the stitched border clouds! So very pretty Joni, love the little dog & cat!! Love the scalloped clouds! Very nice. So cute!!!! I love the sentiment and your design! What a fabulous looking scene! beautiful!! love those little animals! What a lovely card. So creative. What a totally cool scene!! I LOVE how you created the sentiment on the clouds!!! Fabulous design!! what a lovely scene, Joni! Wow! This card is amazing!! What a beautiful card, the scene you created is wonderful and the sentiment is awesome. Really liked the card and its colors. This is just too sweet! And I love the aqua and yellow together! Beautiful card! I love the scene you made and how you did the clouds!!! Beautiful card. Love the scene you've created. I so look forward to seeing you in my inbox and this card is the reason why... I love this card and all you do:) Those clouds are so pretty! Great clouds - and the sequins just set it off. Awesome use of the two stamp sets! Love your creative use of the dies and stamps. Beautiful card. Wow! What a beautiful scene! Oh my goodness, I just love this!!! Beautiful card! Beautiful card and the colors are wonderful! Wow this is beautiful! That tree is amazing and so is the colors in the sky! Fabulous. Love the layers and the sparkly Sequins. So soft and pretty! Love this little scene you created! Awesome card, love the animals! What a darling card and scene!! Very pretty design for this card. Don't sequins just add the perfect touch? Gotta love PPP's sequins! This is adorable. I love the clouds too!! What a tranquil scene! It came out beautifully! Beautiful card! Thanks for the opportunity to win!! I like the sentiment very much, and the softness of this card is brilliant! Your card really made me smile. It's so cute I love it. Thanks. This card is beautiful and intricate. Tfs! I like your non-traditional color choice for autumn, great card. Your cards are so elegant! This one is no exception! Fabulous! Absolutely delightful! Joni, you are so creative! Love the beautiful scene u created!! Love the soft colors! Such a sweet card! I love the colors. Gorgeous scene, so many details and your layered clouds are awesome. Beautiful card, loving the layered clouds! Fabulous card! What a lovely scene! Joni, I love your gorgeous scene. the colours are so pretty, I really like the way you used the stitched borders for clouds. The tree is fantastic and the little cat and dog are so sweet. such a pretty card...... thank you for it. Very cute card. I like the way you created your clouds and your shading is so soft and muted. What an incredible card and your so creative with the way you used the PPP scallop die...amazing! So pretty and creative. The soft colors are beautiful. I truly love your card! The colors are amazing, and the touches of the animals and sequins make it so friendly! Great idea to use the stitched borders for clouds. Thanks for the inspiration. Love how you used the stitched borders, Joni. What a totally gorgeous card Joni ..i love te whole scence you have created here ..your colors are always so flawless !! So gorgeous! LOVING the tree and the animals!!!!!!! Love those stitched clouds and the little scene. Love this card. the layers of clouds, and little dog and cat sharing time together, a funky tree. Such a cute and sweet card! How sweet to add the tiny dog and cat to this dreamy scene. So lovely Joni! I cant wait to get these stitched borders! beautiful card!! I love the way those curved borders became clouds! And the way the sentiment fits with the little animals under the tree. This is lovely! I love your colors and your beautiful design! I love all the detail in your card. I love how fun it is to use stamps and supplies from several companies to create a project that is truly unique! I really like the layered clouds and your deisgn. Lovely card - great use of the distress inks. Thanks for sharing. this is just a wonderful card! I especially love the colored clouds! Thanks for sharing! Oh wow! This is not only adorable but sweet and pretty too! Love the sentiment as well, makes a perfect match to the precious little dog and cat! Absolutely wonderful! Very nice...I can't get over the clouds...and the colors you used are great!!! Oh My - I adore your clouds...! Wonderful use of color, and I love the inspirational quote paired with those images. Fabulous card design! 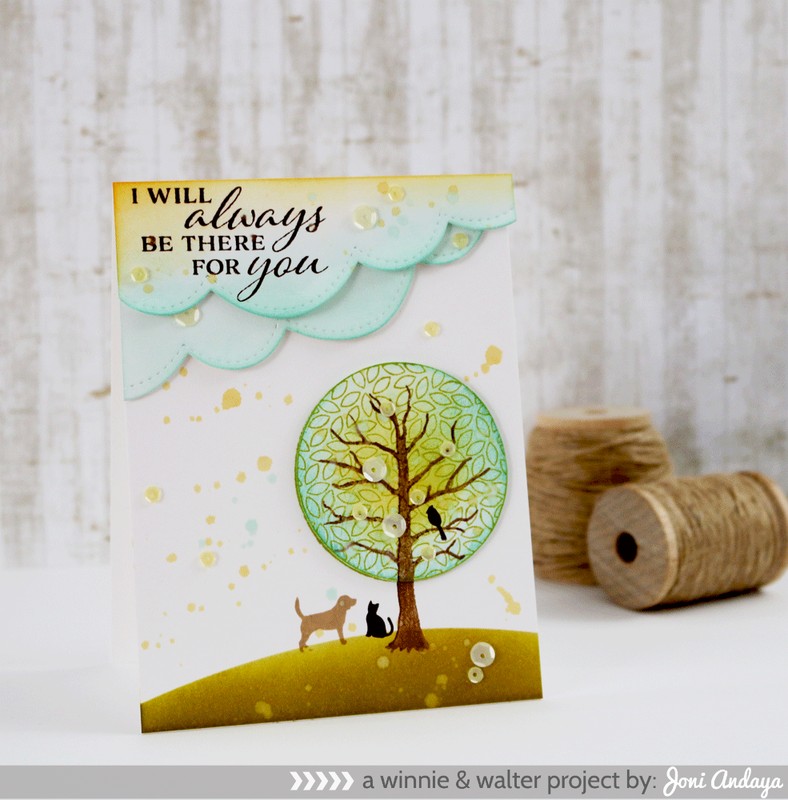 Love the soft cloud look with the stitched border dies (on my wish list) and the little scene with the tree looks great! You continue to amaze me. So very pretty. What a cute card!!! Love it! Very cute card. Love how you inked the edges of the scalloped die cuts. Well done. Love the two tone look of the clouds and the spatter in the background! And my son loves the dog & the kitty ;) Great card! This will really cheer someone up! Love it! My favorite by far! You work amaze me and inspiring me! Love everything about this card! Such a pretty scenic card!! Love the sentiment and the die cutting adds such a Perfect Touch!! Loving everything about this card. Especially the dog, cat, and bird! So precious. This is really sweet. I love the way you created your card. Love the colors and the dimension. Nice card. How sweet are those details & colors?! Love those dies as well!